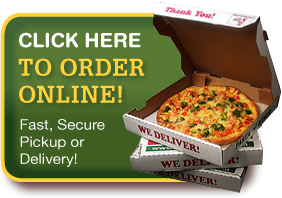 Garlic Bread – Fresh French bread brushed with our homemade recipe garlic butter and then baked in our oven. Bread Sticks – Stick-shaped roll brushed with our homemade recipe garlic butter and then baked in our oven. Served with a side of marinara sauce. Cheesy Bread Sticks – Stick-shaped roll brushed with our homemade recipe garlic butter and smothered in melted provolone cheese. Served with a side of marinara sauce. 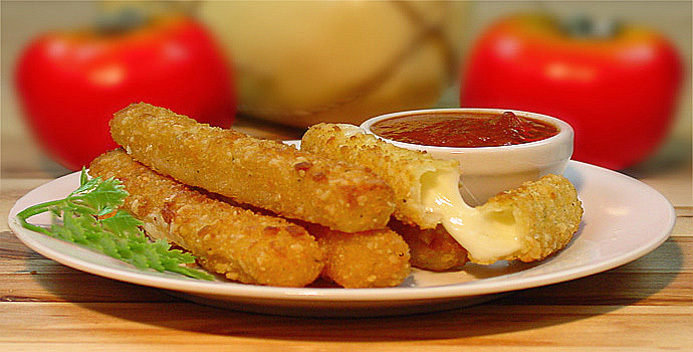 Breaded Provolone Cheese Sticks (pictured above) – Provolone cheese breaded and deep-fried to a golden brown finish. Served with a side of homemade marinara sauce. Crinkle-cut French Fries – Our famous crinkle-cut french fries deep-fried to a golden brown perfection. Loaded Cheese Fries – Our crinkle-cut french fries covered in provolone and cheddar cheese and topped with crispy bacon. Served with a side of ranch dressing.